The Local Group has recently created a Community Page on Facebook. It’s a page on the main RSPB South West Regional page. We want to create an environment for lots of people to enjoy. Not only will we let you know about upcoming events and local news we would love for YOU to get involved. 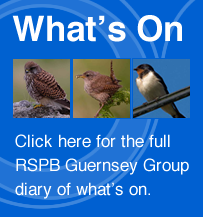 Search RSPB Guernsey Local Group or visit the RSPB South West page and click on Groups on the left side of their page. Click on the link for RSPB Guernsey Local Group and once you’re in enjoy but please don’t forget to ‘Like’ us and ask to be added as a member. That way we can keep in touch with you. For a community page to be successful it needs you to get involved. We would love for you to send us snippets about how you first came to love nature, what inspired you, tell us about the wildlife in your garden and what you see when you’re out and about and send us your snapshots; they don’t need to be professional standard. Let your friends and family know about our new page and let’s get talking and sharing. Ken Tailby recently decided to hang up his RSPB binoculars and sadly left our committee. Ken had been on committee for 14 years so he’s well and truly done his bit. We wish him well and thank him for all his hard work over the years. The good news is that Cathryn Tyrrell recently joined the committee. Cathryn is a keen naturalist, having studied biology at Cardiff University. We are very pleased to welcome Cathryn to the group.